“Assembly required” is a phrase that can trigger feelings of intimidation, fear and frustration – sometimes all at once. With the exception of a few gifted individuals who love to assemble products (and who therefore become their family and friends’ go-to person for any variety of DIY projects), most people do not enjoy reading cryptic instruction manuals that may as well be written in another language. 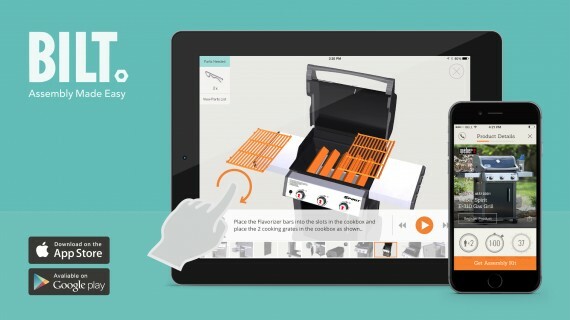 BILT is an app that re-imagines the “assembly required” experience for both consumers and manufacturers. Assembling something with BILT is like having an expert by your side. An interactive 3D model of your product lets you see exactly what you’re doing; and audio-guided instructions tell you what to do step by step. Compared with paper instructions or even YouTube videos, people using BILT make significantly fewer errors. This means happier consumers and fewer costly returns for the manufacturer – it’s a win-win. BILT also reduces customer service calls by turning people into confident do-it-yourselfers. We place everything needed for assembly right at your fingertips – you can zoom, rotate, and tap your way through assembly at your own pace. And unlike many call centers, BILT is available 24/7. Occasionally, an error may slip in to printed instructions manual – hey, mistakes happen. With BILT, manufacturers can update and make changes to instructions immediately without going through the lengthy and costly process to reprint and repackage. With BILT, manufacturers get far more insight into the people who are actually buying their products. We make registering a product so quick and easy – a simple click instead of dreaded paperwork – that people are much more likely to follow through. This allows manufacturers to connect and build relationships with their consumers that were never possible before. Not to mention, consumers who use BILT feel a profound sense of accomplishment by successfully assembling something on their own, which means they are more likely to promote a manufacturer’s brand to their friends and family. The variety of manufacturers and products already available in BILT shows just how flexible and far reaching our app can be – from Weber grills, to Bell Sports child carriers for bikes, to Teeter’s inversion table, to Liberty Garden’s hose reel, and many others. BILT changes the way people think about instructions and how they assemble, install, and maintain their products.